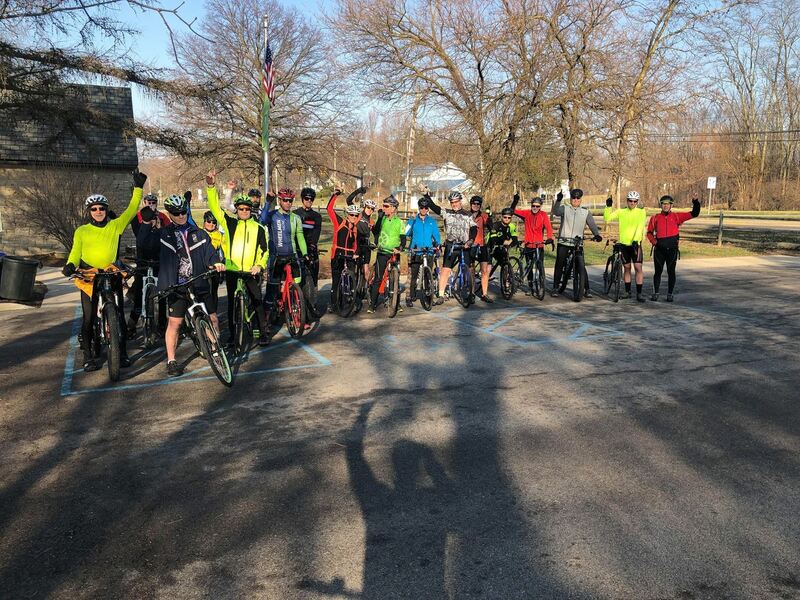 Meandering group Ride is great if you are learning to ride in a group or just want to ride for fun. This Saturday looks like it’s going to be a great day to ride. Meet in Whitehouse ready to ride at 9:00, riding to Grand Rapids, 32 miles. Bring a snack for our short stop in Grand Rapids. The Hippy Chick Bus will be our photo op Saturday. Come out and join in the fun. THIS IS A NO DROP RIDE. Lunch at the Buzz after our ride. Join us on Memorial Day, Monday May 27th, to honor our fallen. Sunday looks like a different story. Unless the weather forecast of rain, rain, and more rain is wrong, we won’t be heading out to Metamora this Sunday. Keep your eye on the weather. If the rain does not materialize, meet at Wildwood for a 9:00 a.m. roll out and breakfast at the Country Charm. 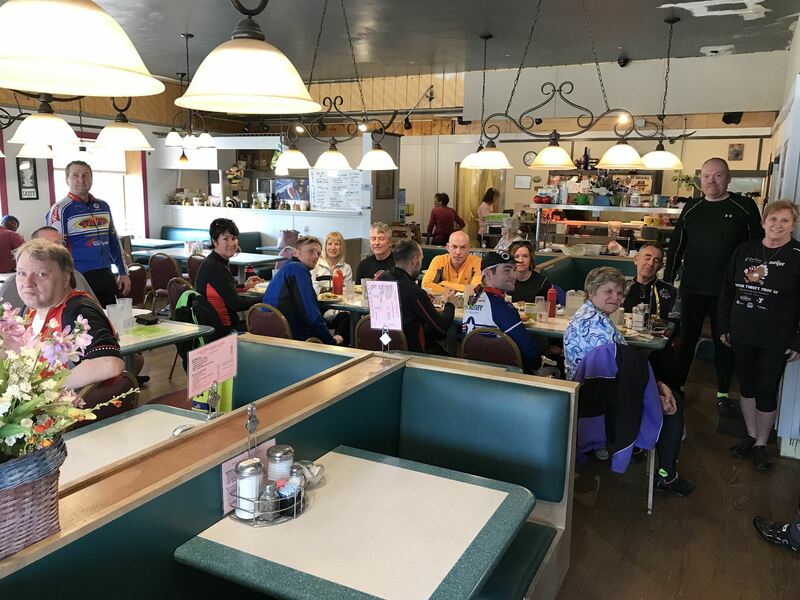 Sunday morning, 18 riders rode out for breakfast at the Country Charm Cafe. The restaurant was very busy since we were 1 hour later than our typical summer schedule. The folks at Country Charm handled us with ease and seated all of us with a minimal wait. I felt bad the Mike Daum was unable to stay for pie. Veteran Sunday Ride Leader, Ron Toneff was in the House and stopped by our table to say hello, before heading back to Sylvania. The unexpected nice weather must have contributed to the large turn out. Some riders where shaking off the cobwebs from Winter, while a few had trouble keeping a medium pace, pulling the group apart. Those few will have their tires slashed prior to next week’s ride. All in all everyone did well. 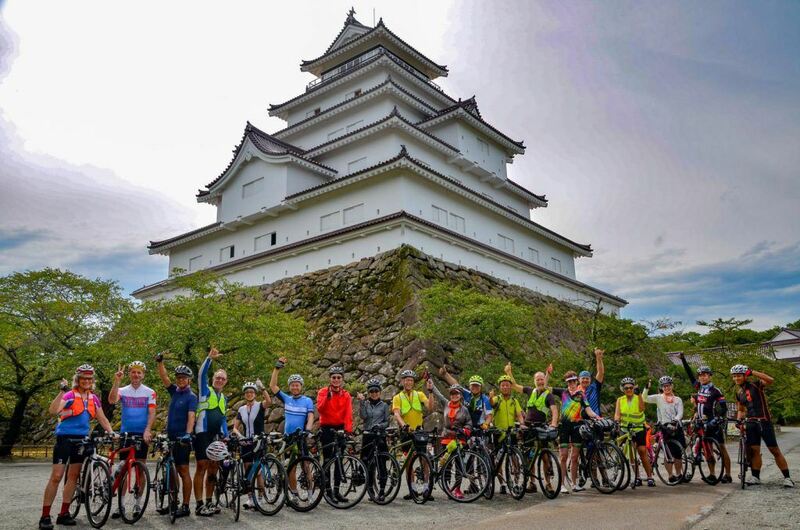 Here is a snap shot from another bike club enjoying their ride to Tsuruga Castle in Fukushima Prefecture, Japan. Come on out next Sunday for a social easy paced ride and good tasty fun. "What a beautiful day to start our group ride, picture perfect! 15 riders joined in our group ride, enjoying each other’s company. Want to welcome our 4 new riders to the group. You did a fantastic job!!!! Also as you can see Saturday Adventure group n Meandering Group riders enjoyed breakfast or lunch at the Buzz. VERY FUN DAY!!! 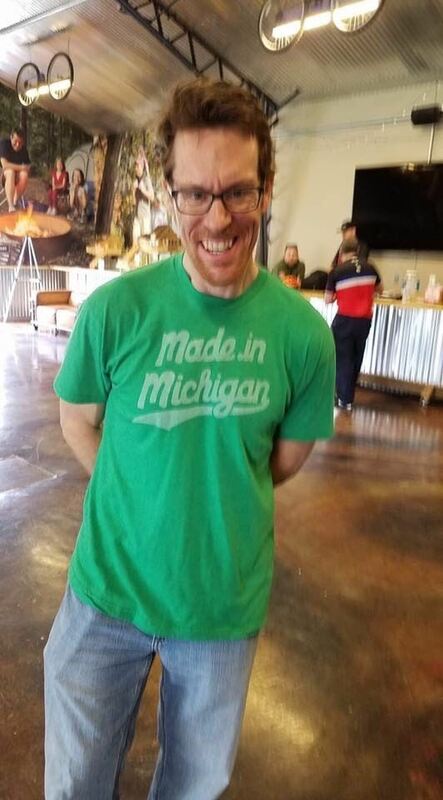 Next week Meandering Group Ride will be riding to Grand Rapids 30 to 32 miles. Hope to see you next week." 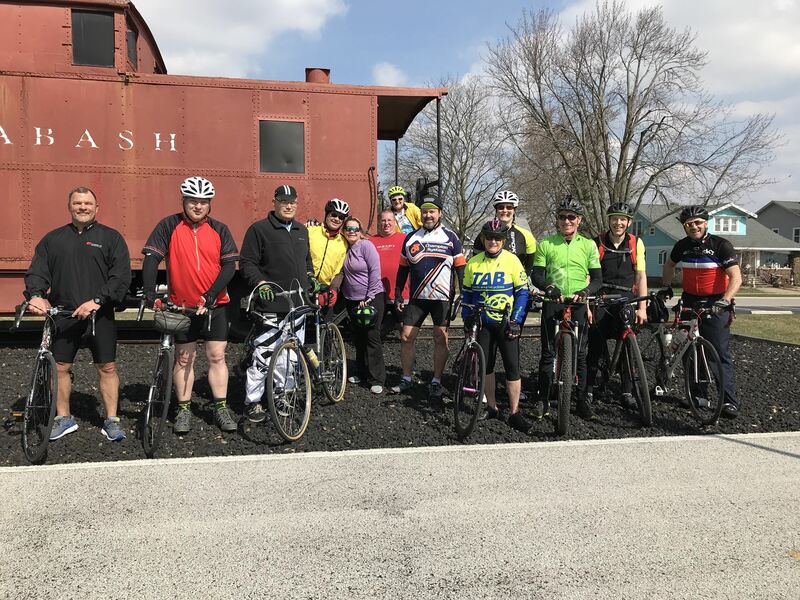 Twenty-one riders enjoyed perfect weather and a great ride down and back on the Towpath for the first Intro to Gravel Ride. One near miss of a suicidal squirrel is all I have to report. Greg, Chris, and I took off from Waterville to attend the Winter Warrior finale. Along the way we ran into John and Alan and had a short rendezvous with the Meanderers in Whitehouse. Great day to ride! The next Intro to Gravel ride leaves from Pacesetter on 4/20 at 9am. However, if you are up for a serious challenge, the Summer of Stupid opening day is riding Poto and DTE, same day, same time. Either way, you'll get a little dirty, and dirt is good. Of course, there were those first ride blues too – I took an early turn, tried to adjust, and wound up with a an extra 1 ½ mile detour. As Hubert says, “Bonus Miles”. And we had the usual, early year bugs. Craig Miller and I both flatted – Craig with a cut tire, and me with my first flat in 2 years. Nicole Sicha lost her rear disc brake on her mountain bike. And Alan Frischman found he need to brush up on his gravel skills. But all in all it was a nice start to the season. Next week’s ride is scheduled to leave at 9:00 from Cyclewerks in Whitehouse for a 40 mile cruise to Liberty Center. Debbie Tassie will be your guide and leader. Be sure to come and join us! This Saturday is our first group ride of the season. Not only does the weather look good it is also a birthday ride for me. We are going to keep me young by riding 25 to 30 miles (not even in my dreams). Remember this is a no-drop ride and will stop when anyone needs to. Be ready to ride at 9:00 In Whitehouse. Hope to see you there. Jenny Hansen, the Safe Routes to School Coordinator, is looking for volunteers to help with this spring’s bike fix it events. Below is a list of dates, locations, and times of the specific events. Please contact Jenny if you are available and willing to help!